A model for solving transient groundwater flow in confined, unconfined and leaky aquifers. CVM10 is a cartesian and radial finite element groundwater flow model. It simulates groundwater flow in confined, unconfined and leaky aquifers, under steady-state and transient conditions. 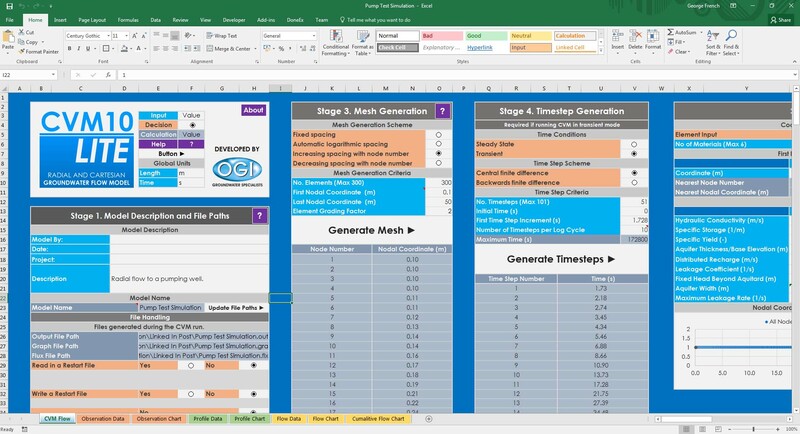 CVM10 has two main components: an extremely quick finite element solver built using FORTRAN, and a front end user interface built in Microsoft Excel. This combination makes running models and displaying results quick and easy in CVM10. CVM-LITE is ideal for simulating the monitoring results from a pumping test, where parameters of Transmissivity, Storage Coefficient, Leakage Coefficient and Head Boundary Conditions can be adjusted to best match the observed drawdown and measured pumping rate. CVM10-LITE can simulate Theis confined aquifer conditions and Hantush leaky aquifer conditions, and can simulate radial flow to a well under either constant pumping rate or constant drawdown conditions.Left: Modelling a constant head pump test in CVM10-Lite. 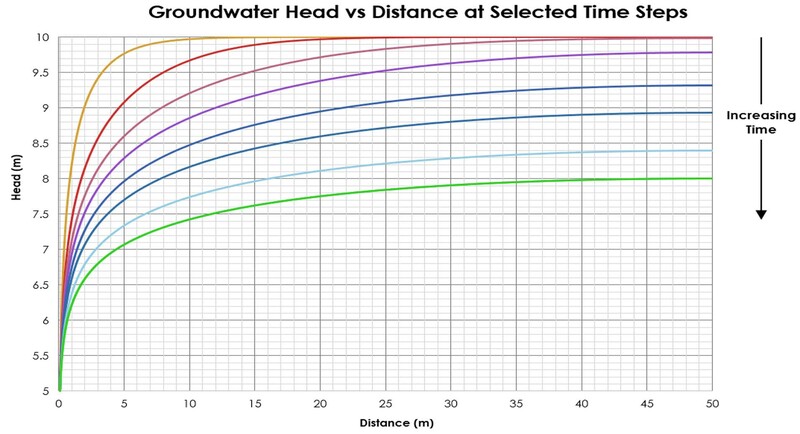 The profiles show the change in groundwater head with time in the aquifer. The initial water level in the aquifer is set at 10m and the head in the well is kept constant at 5m. Distributed recharge to the aquifer (i.e. 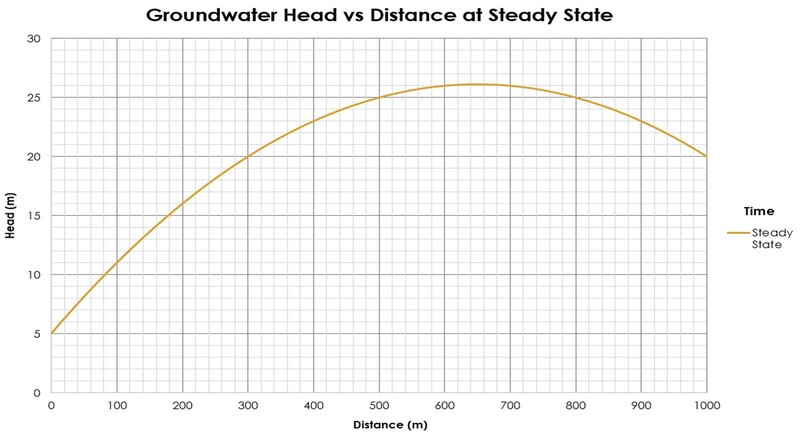 rainfall) can be modelled as a constant recharge rate, or a variable leakage rate with recharge proportional to the drawdown from an initial uniform head.The example below shows how a confined aquifer is modelled under constant recharge conditions when the boundary conditions at both ends are known. To download CVM10-Lite, please fill in the form below. A download link will become available once submitted. At this time CVM10 is only supported on Windows PCs (32-bit and 64-bit). To install CVM10 the download package must be extracted to access the files. Windows 10 has a built in extractor. If you are running an earlier version of Windows then you may need to install some software such as 7zip or WinRar. There are installation instructions included within the download package which MUST be followed to set up CVM10 correctly. Please bear in mind this is a beta version of the software. You may run into some difficulties/bugs when running the software. If you would like to report any issues or submit any feedback then please get in touch by emailing George French at george.french@ogi.co.uk.